“Winter’s a good time to stay in and snuggle, but put me in summer and I’ll be dripping in sweat and absolutely miserable…” So goes the totally correct and not-altered-in-any-way lyrics to a popular Disney song. Summer is officially here, and hundreds of thousands of people will be visiting Walt Disney World. While summer at WDW is a great time to enjoy long operating hours and loads of new attractions, it’s also a test in endurance thanks to the Orlando heat. 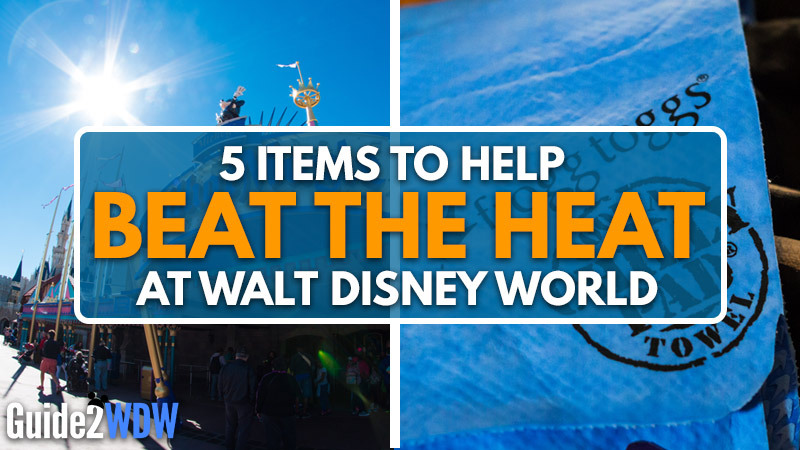 If you’re planning on going to Orlando (or anywhere hot) during the summer months, here are five items that are vital for beating the heat. 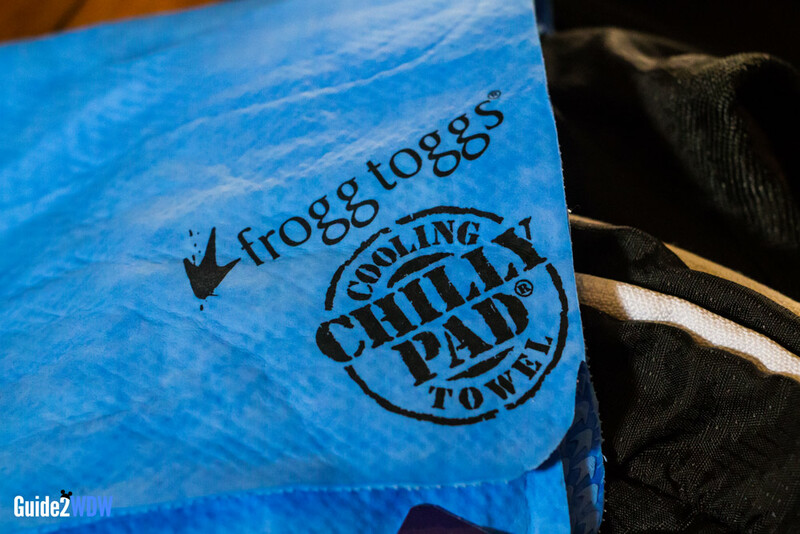 The Frogg Togg Chilly Pad is either a marvel of modern science or the result of some kind of dark magic… I’m not sure which, but I’m not complaining. Take this towel, soak it in water, ring it out, and it will cool you off while remaining mysteriously dry thanks to the water evaporating off of it. There are many cooling towel options, but Frogg Togg is my personal favorite. That’s why I featured it as one of my 11 essential items to pack for Disney World, and Guide2WDW readers have reached out to me to let me know they agree. If you’re looking to cool off, the Frogg Togg is the first thing you should buy. Recommended Item: Frogg Togg Chilly Pad in the color of your choice. A light breeze can make all the difference on a sunny day. That’s why I’m a fan of carrying around a personal fan, which is a life saver while waiting in lines or waiting for the parade to start. My personal favorite are these small fans that you can plug into the power port of your phone. They’re small, surprisingly refreshing, and extremely affordable. Amazon has a 3 pack for around $10, so you can get multiple fans for each member of your family. They also work with both iPhones and Android phones. If you’re looking for something with a bit more cooling power and don’t mind carrying another small device, this USB Cooling Fan includes a mister. Let’s face it, summer in Orlando can be downright oppressive between sudden downpours and an unrelenting sun. Why not be prepared for both? An umbrella is not only your friend when it starts raining. It’s also a great way to provide yourself with some shade and protect yourself from the sun. Certain umbrellas have UV resistance, like this Ultra Light, Ultra Mini Crackajack Umbrella. Whenever I look for an umbrella to carry around with me at Disney World, I try to find something extremely small and light that I can just stick in my daypack, and this umbrella fits the bill. It also has 95% UV protection. My mom always brings an umbrella for the sun whenever she visits Disney World, and she receives many comments from strangers about how smart she was to provide herself with some shade. Recommended item: Ultra Light, Ultra Mini Crackajack Umbrella. When the heat is in the high 80s and up, it is vital to stay hydrated. Not only will it keep you cool, it will also prevent you from feeling sick while visiting the Happiest Place on Earth. While you can always get free ice water from any counter service restaurant, I always like to bring a water bottle with me to any Disney park. This way I can start off the day with ice cold water, refill it whenever I want, and stash it in my day pack when I’m going to go on a ride. With soft drinks and ice water in paper cups, you wouldn’t be able to take the cup with you onto a ride, which may prevent you from drinking as many fluids as possible. However, not all water bottles are created equal. I recommend getting an insulated water bottle, like the extremely popular Hydro Flask. Because the bottle is vacuum sealed, it will keep your ice cold water icy cold all day. Nothing is worse than warm water on a hot day. (Well, except for dehydration). “An ounce of prevention is worth a pound of cure.” I’ve been to Disney World countless times, and so I’ve had almost as many experiences of getting a bad sunburn and then spending most of my vacation feeling hot, uncomfortable, and sticky from aloe vera. That is until I got serious about applying sunscreen every morning before going into the parks, and then refreshing my sunscreen in the middle of the day. If you’re going to Disney World in the summer, sunscreen has to be on your packing list. I’d personally recommend getting a sunscreen spray for quick application in the morning, and then bringing a sunscreen stick in your bag for a mid-day sunscreen refresh. The great thing about the stick is that it’s easy to carry around and it’s easy to apply to yourself or your kids. Hopefully this article will help you stay cool during your visit to Walt Disney World and wherever else you go this summer. Let me know if there’s anything you always pack to stay cool during your travels! I’d love to find out new ways to stay cool and comfortable while on vacation. What I did last summer was instead of a water bottle, I had a 2L water bladder bag instead. I would fill it with a little ice at the hotel and when we got into the park I would fill it with water from the fountain. The bag was insulated so it kept the water nice and cool throughout the day. The bag was small but it was still big enough to hold my phone and wallet alongside the water bladder.